St. Joseph RC Church in Babylon, NY has to be one of the most beautiful churches on Long Island, New York. The classic architecture composed of it’s beautiful brick walls, stained glass windows and the ornate domed ceiling define it as one of the most picturesque houses of worship this side of the cathedrals of NYC. I attempt to create beautiful portraits of all of my brides and grooms in their ceremony venue after the nuptial mass or ceremony is over. 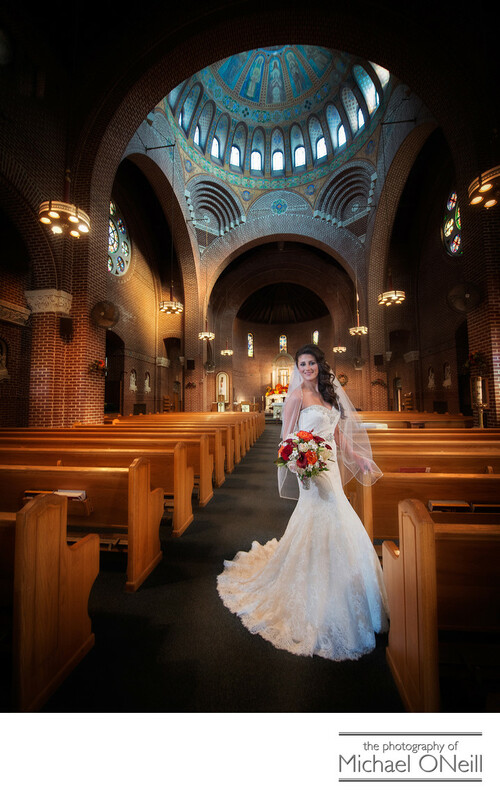 Choosing the right church for your wedding vows is one of the most personal choices you will make when you are planning your big day and I always strive to create amazing photographs of you in this venue. It’s such a perfect time and place to capture full length images of your wedding dress showing off the front and rear details of your magnificent gown. After this image was created we left church with the bride, the groom and their bridal party for some outdoor environmental photographs at the Bayard Cutting Arboretum in Oakdale, NY and then went on to their reception venue, Villa Lombardi’s in Holbrook, NY. I work regularly at Villa Lombardi’s and their other wedding venues, Lombardi’s on the Sound in Port Jefferson, NY and Lombardi’s on the Bay in Patchogue, NY. I also visit the Bayard Cutting Arboretum on numerous occasions each year and have experience with all the best locations within that park to create amazing wedding photography. If you are planning a Villa Lombardi’s wedding, a Saint Joseph’s wedding ceremony or a trip to The Bayard Cutting Arboretum for your candid and casual wedding photographs give me a call. I would love to discuss all your plans for the big day.